She's no stranger to showing off her sensational style. And Jade Thirlwall stunned once again as she joined her beau Jed Elliott for a date night at Bunga Bunga in Covent Garden on Saturday in a very brave number. The songstress, 26, proved she wasn't afraid of the stormy weather in the capital as she showed off plenty of leg in a pair of studded shorts. Jade definitely knew how to make a statement as she donned a tee with the slogan 'f**k normality'. She entered the venue in a pair of sky high black stilettos but as the night came to an end the Little Mix star swapped them for a pair of comfy trainers. The beauty wore her curled locks loose around her shoulders and sported plenty of sultry makeup for the night out. 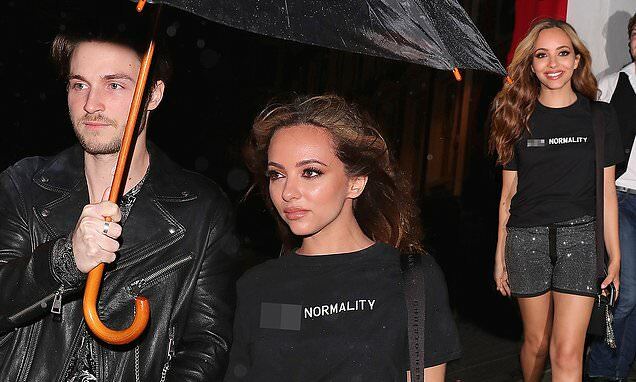 While The Struts star Jed showed off his chivalrous side as she held an umbrella to shield the pair against the wet weather while clutching onto Jade's hand.